It’s hard to enumerate all the highlights on the best of British Columbia rafting journey, but a list of its many wonders would include alpine scenery, desert badlands, canyons, First Nation’s culture, wildlife, whitewater and Hell’s Gaye, – this trip has it all. The river that started it all for Canadian River Expeditions in 1972! Join us on this unbelievable wilderness journey, travelling 250 kilometres (155 miles) by river through the best of British Columbia. Experience the incredibly varied, dramatic landscapes this trip has to offer, from forests and grasslands, to hoodoos and sand dunes, to towering rock walls and canyons. Rich in cultural history, and present day use, the rivers in this area are of vital importance to the remote First Nations communities that rely on them for sustenance fishing. 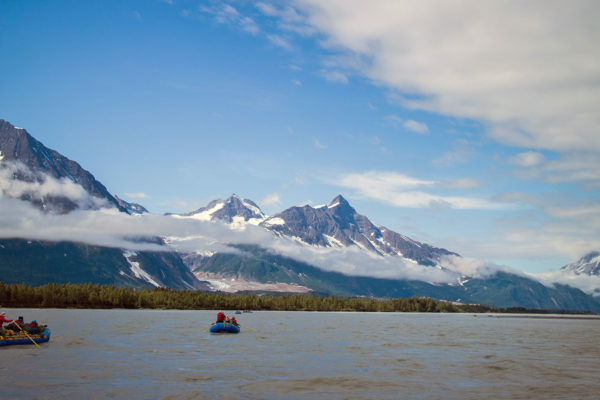 Wildlife viewing opportunities abound on this 8-day expedition – watch bear, moose, California Bighorn sheep, eagles, and occasionally, pelicans and sandhill cranes, as the river carried us downstream at its ever-changing pace. 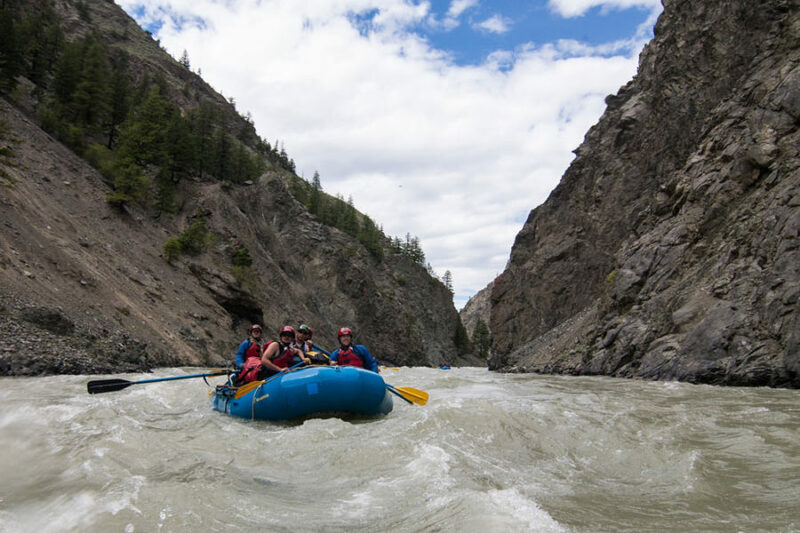 For over 25 years this rafting trip has been our flagship expedition, and out of all the rafting trips in our repertoire, this adventure involves the most whitewater. 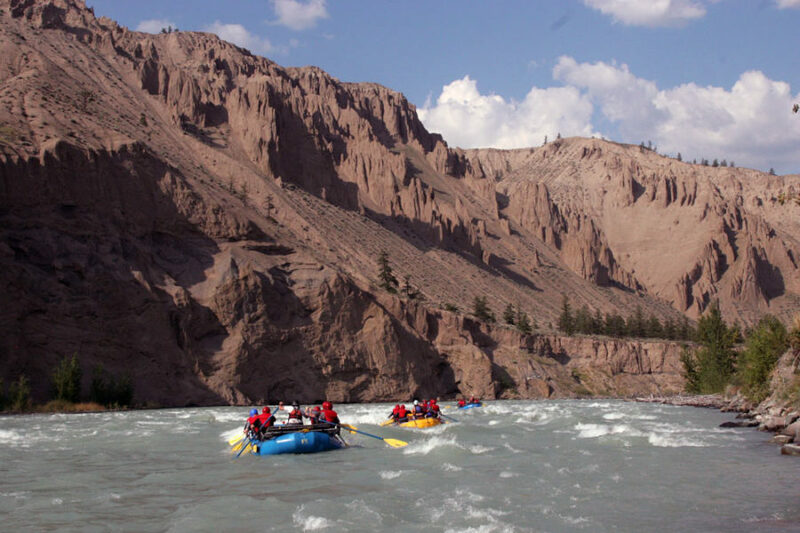 Note: This trip is outfitted by Big Canyon Rafting, with guides from Canadian River Expeditions. You’ll arrive in Williams Lake, BC. This is a small town in the interior of BC, founded during the mid-1800’s gold rush, and built on the ranching and timber industries. Increasingly, it is becoming known for its impressive network of mountain bike trails, challenging rock climbing routes, and high- end custom log home construction. The pre-trip meeting will take place at the Ramada Hotel at 8pm. Your trip leader will review some of the final details of the trip before we head off the next morning. After breakfast we will load up for a scenic 3-hour drive, low in the Fraser Valley, then high up onto the Chilcotin Plateau. We drive through several of the First Nation communities who are part of the Tsilhqot’in Nation – meaning “People of the Blue Water”. We will make our way up the Nemiah Valley to our put-in on the Taseko River, which roughly divides the Xeni Gwet’in and Yunesit’in First Nations’ traditional territories. Throughout history and to the present day, this area has been very important to the Tsilhqot’in for sustenance fishing, hunting, and collection of medicinal plants. The area on the west side of the Taseko River was the subject of the 2014 Land Title decision, which established land title for the Tsilhqot’in. After lunch, our rafting journey will begin as we push off from shore into the milky white waters of the Taseko River. After a few hours of a relaxing afternoon float into the wilderness, we will make our first camp. After a tasty breakfast we will pack up for a stunning day on the water including some beautiful deep canyons and exciting rapids including Taseko Falls. 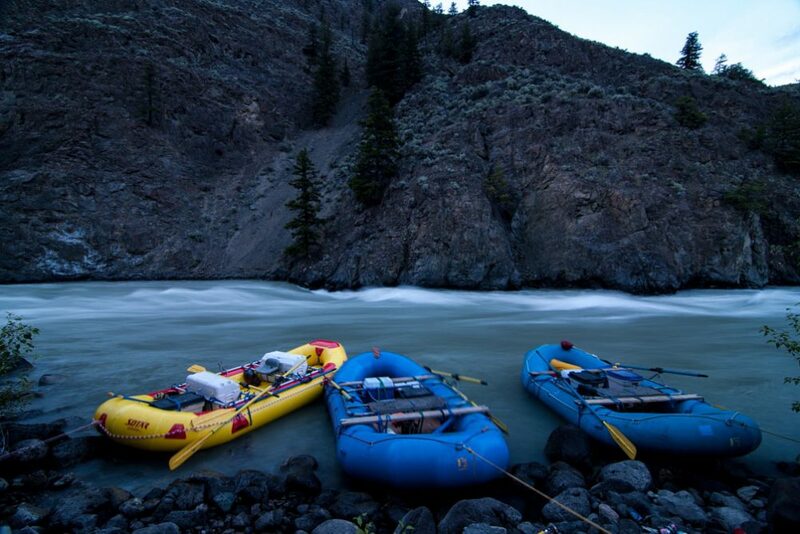 After an action packed day of whitewater we will camp just above the junction of the Taseko and Chilko Rivers. 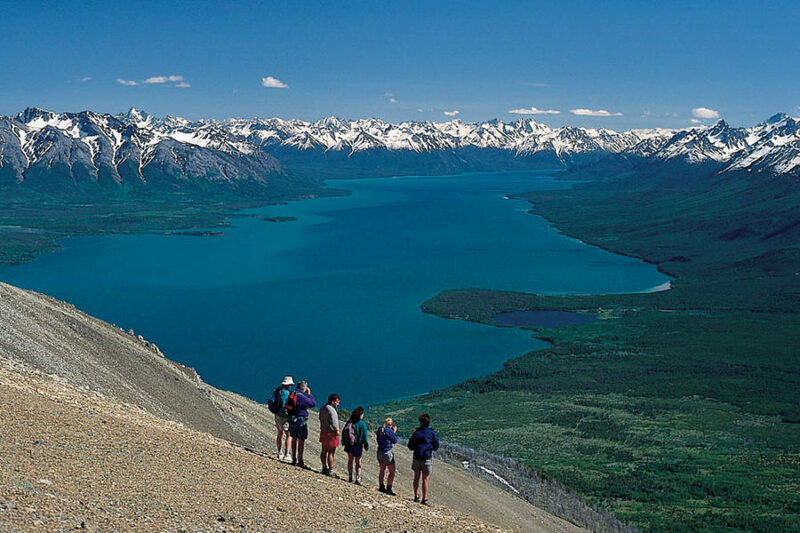 First thing this morning we will make our way to the stunning Chilko-Taseko junction. Here the blue waters of the Chilko River flow in from the west and our rafts will ride the contrast of the waters at the confluence. Now the Taseko River terminates and we are on the Chilko River. Our morning continues with some excitement as we thread the “Gap” – a very narrow bedrock chute in the Chilko River. A few miles later the tiny Chilcotin River sneaks into the Chilko and the river now takes the name Chilcotin River because of that river’s longer headwaters. 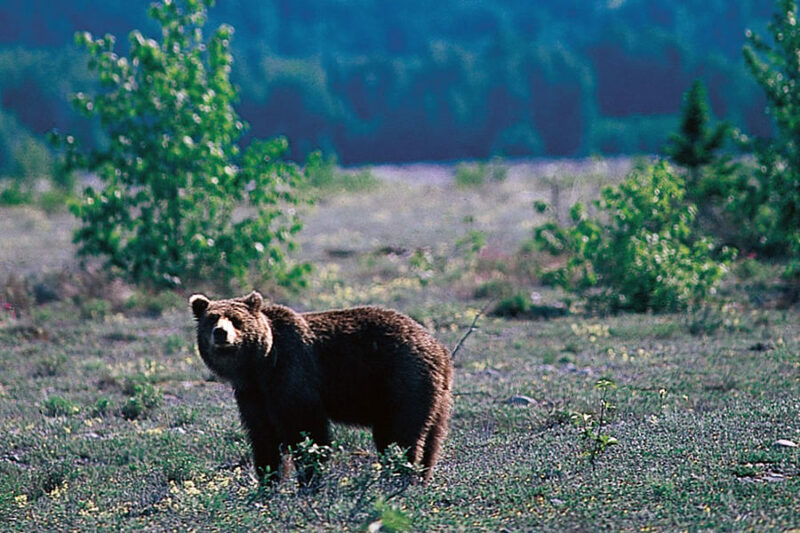 their adaptability by also inhabiting the dry semi-deserts of the interior along the Chilcotin and Fraser Rivers. 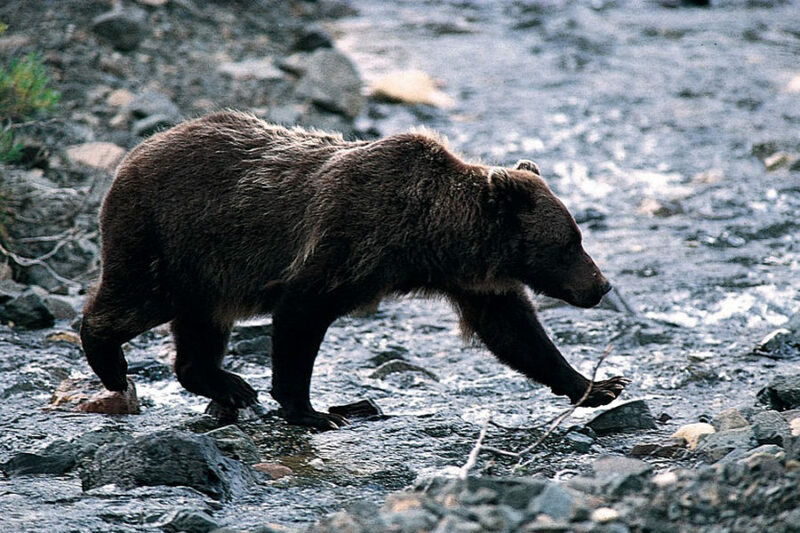 Some of these versatile creatures include bald eagles, black bears, grizzly bears and cougars. We will make camp in the heartland of the Chilcotin ranching community. While the plains appear to be simple grasslands, this area is part of the most bio-diverse region of British Columbia. 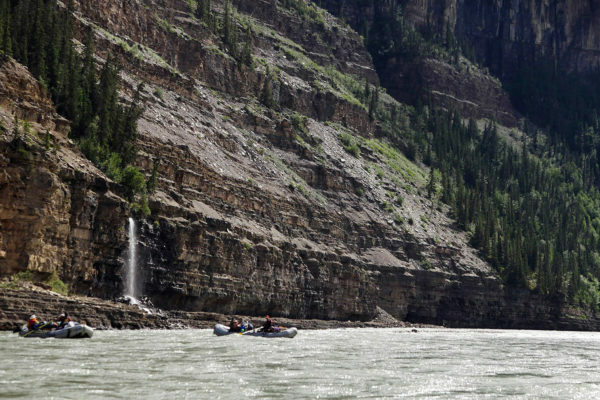 After breakfast, back on the river, we will descend into Hanceville canyon, with its 200m tall towering rock faces, As we negotiate the canyon, we’ll pass a traditional fishing site – we may have the chance to give a passing wave to First Nation fishers out with their dip nets. Afterward we challenge some fun roller coaster rapids named “the Goosenecks” in Hanceville Canyon. We’ll see bald and golden eagles, and if were lucky, we might spot a black bear and some California Bighorn sheep. 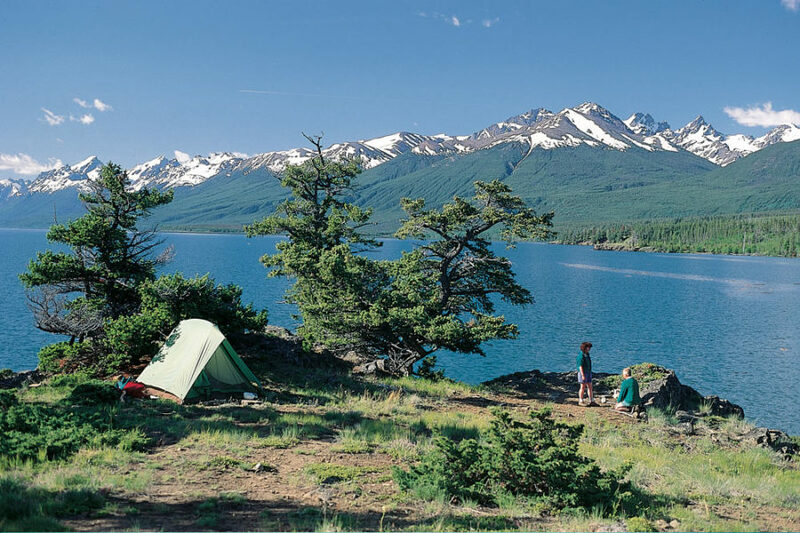 In the afternoon we’ll set up camp at the confluence of the Chilcotin River and Big Creek, The camp is in the Big Creek Ecological Preserve. After some delicious appetizers, we’ll have another fantastic dinner and get some rest. The camp is so beautiful, you won’t want to leave. Good news: we’ll enjoy a layover at Big Creek for two nights. It’s set in an open forest of young firs across from a high basalt cliff that echoes the sound of the rushing water Big Creek itself is a small trout stream, its warmer waters forming a gentle succession of quiet pools and rounded boulders – perfect for bathing. This is a sleep-in day and while we put out coffee, fruit and cereal for the early risers, you can also opt to enjoy brunch midmorning. Afterward you can fish in the many pools in Big Creek, go for a hike rewarded with panoramic views of both the surrounding canyons, explore a pioneer homestead, or relax with a book back at camp. As soon as we push our boats from shore, we enter the exciting standing waves of mile-long Big Creek Rapid. The scenery changes again: desert hoodoos, fewer trees and more open sagebrush and cactus country. The air is noticeably drier and warmer here, and the smells of the sagebrush and sweetgrasses enchant the senses. Before lunch we pass the intricately dovetailed log buildings of an abandoned pioneer ranch. Prepare to have your breath taken away as we enter the iconic Farwell Canyon, with its towering hoodoos and beautiful sand dunes, the largest in BC. Farwell was the site of a Chilcotin village and is the location of an annual First Nations salmon fishery. Pictographs are still visible on the rocks. The old, faint rock paintings are still preserved in the dry, desert-like climate. 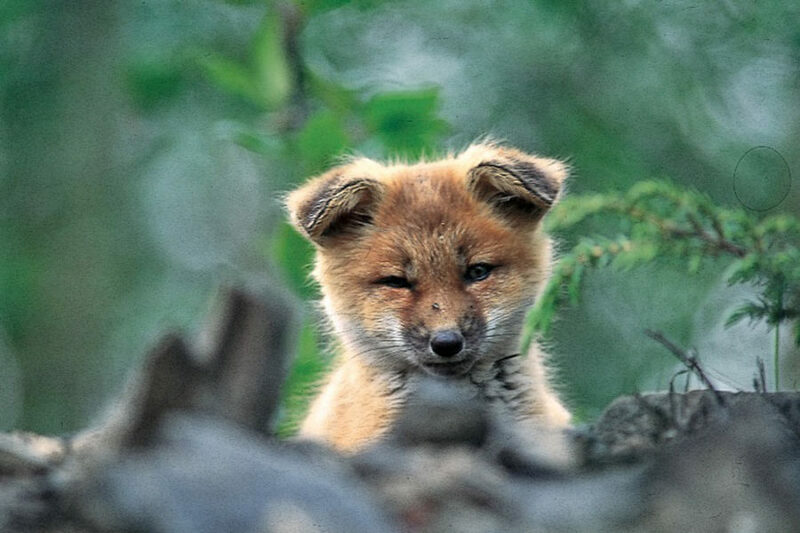 There are images of salmon, bighorn sheep and deer – the others take a little more creativity to identify. At Lunch we will take some extra time to hike high up a ridge into the towering hoodoos which make up the left bank of the river, or if you would rather, relax on the sandy beach. Camp tonight is on the flats just above the last canyon of the Chilcotin River, there are easy walks or hikes in all directions. 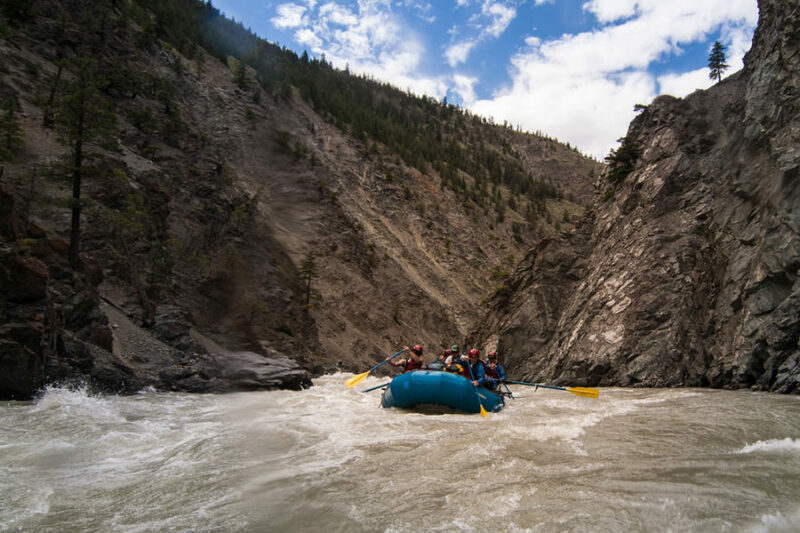 After breakfast and before we make the Fraser River confluence, we enter Big John Canyon – the deepest canyon on the Chilcotin River. It’s a fun roller coaster ride, and one of the whitewater highlights of the trip. Often it’s possible to see salmon bunched up in the surging eddies along the cliff walls resting before spurting up the next part of the rapids. 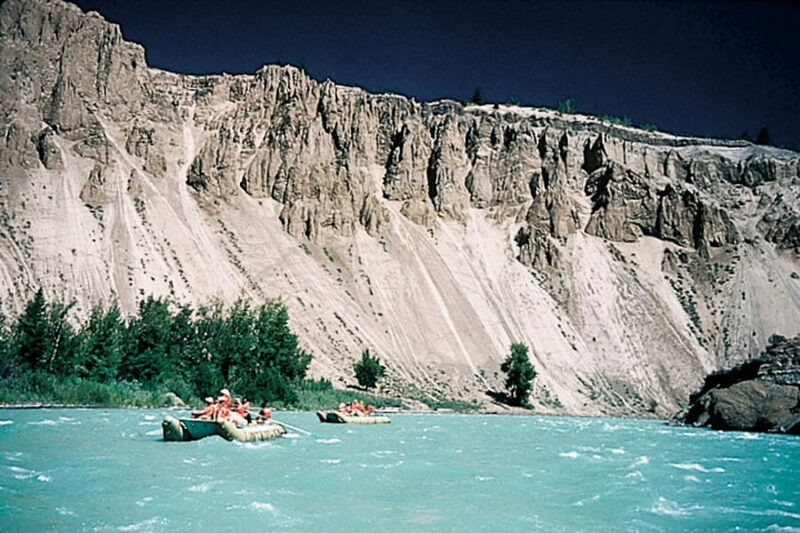 The turquoise waters of the Chilcotin are quickly swallowed by the massive flow of the silty Fraser River which commonly runs 10 times the maximum flow of the Colorado River. Once on the big river we can put up our feet and take in the new scenery while feeling ever so small in our new surroundings. We plan to spend our last night at a beach camp, relaxing and reflecting on where we have been. Here in the dry, clear interior of B.C., the night skies are quite spectacular, made more wonderful by the occasional appearance of the northern lights. It’s a great spot to wander away from the glow of the campfire and identify the constellations and see the full glory of the Milky Way. On our final float, the land on the west side of the river is the Gang Ranch, once the largest ranch by area in North America, surpassing even the King Ranch in Texas. We will take out raft out of the river at Churn Creek protected area and load the bus for an incredible drive back to Williams Lake. Please note: The above is a tentative itinerary and has been designed with much thought to capitalize on the most scenic and exciting parts of the river, while making time on other sections. Your guides will adjust the schedule to make the best use of river and weather conditions. Meals and pre- and post-trip accommodation in Williams Lake and Vancouver are your responsibility – the cost is not included in the trip fee. Breakfast, lunch, dinner and snacks are included from the Day 1 lunch until the final river meal. Any other meals off the river are your responsibility.